The ultimate comic to me is now Don Rickles who I used to hate as a child but now see his irreverance as funny. We are watching a movie called, “The Don Rickles Project” (from Netflix) and it is hilarious. He told a lady after he asked her what her ancestry was, “If you are not Chinese, you’d better get your eyes fixed.” Such irreverance! Such disregard! Such audacity can only be pulled off by Mr. 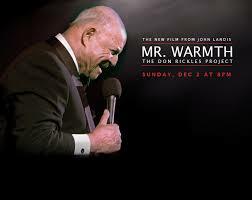 Warmth himself, Don Rickles. People around me have been funny enough though lately. Someone said that when Obama was standing in front of all those people during his inauguration this was going through his mind… “So this is what it was like to be Freddie Mercury.” I LOL and wondered where some people come up with this stuff. The country was awash today in excitement. Images of the crowds attending the inauguration were amazing. We are celebrating now by taking time off to reflect upon all the blessings that we have in this country. God Bless America! My husband’s phone has begun to ring because people are now asking about charter fishing trips. Now that the weather is getting warmer people are wanting to be outside enjoying the warm sunshine. It was 85 degrees today and I felt the radiation of the sun on my skin enough to remind me of how hot summers are here. I am also bringing in income to the household and now have about four jobs. The truth is I have more than that but they are “on call” jobs and I am called as needed. The four jobs I have are part-time and somehow I am able to handle them all with personal time left over for me. I hope that this good spell continues and that the winds of prosperity do not change soon. Prosperity brings peace and peace is now a very desirable blessing that I desire. I used to think that the peace that my mother enjoyed in her life was boring but now that I am older, I see how wise people see that drama and chaos is a distraction and a drain on one’s spirit and life. Peace is golden. Why do so many people come here? Could it be the tropical beauty of the area? The colorful characters you meet? All I know is that our wonderful Winter Texans are here in full force and I am so happy! You want to talk about sweet, kind, wise people? They are here! Yay! What a wonderful time of the year! These clouds reminded me of a Rorschach ink blot test. You know the one where you “see” something that tells a lot about you. For example, I saw flames of fire leaping but I know my friend, Sam, would’ve seen Farrah Fawcett in these clouds. (He could see Farrah in a palm tree.) Rob, a surfer, would have immediately seen waves and headed out to the beach to see if the sky was reflecting what was going on in the surf. Everyone here has their own different perspective on life but we all agree on one thing: We are blessed because we get to live our lives here. This is why we don’t need drugs down here. What for? Life blows you away without drugs here. There is a reason Walgreens is open on Christmas… greed. I just came from there and I am hopping mad because I have known for years that the generic brand of a medicine is the same damn thing as a name brand only you pay double or more for the name that makes you feel good like Johnson and Johnson, Bayer, Tylenol or whatever makes you yearn for your mommy. Some of my favorite classes in college were health classes where we took apart the health industry. I have always known to buy the store brand of something at the grocery store instead of the name brand because it is the same thing if not super close. You can save over $3 or $4 buy just looking right next to the name brand and getting the imitation. On some things it makes NO DIFFERENCE WHATSOEVER. On things like Oreos, Nutter Butter, ice cream, and certain other products where the taste and texture could not be copied then you MUST buy the name brand but on most things it is better to save money because who is going to be impressed by the name on the box? So my husband is at Walgreens and has to see the pharmacist because his nose is SO runny. (He refuses to acknowledge that his smoking plays a part in his messed up respiratory system.) The little pharmacist intern immediately reached for the expensive box of brand name decongestents. I said, “No, get the generic ones to the left about 5 boxes to your left.” So he gets the generic brand but a huge box for $15.99. I said, “No, there is one just like that with less in it for $5.99. See it right there to the left, right in front of you?” and the manager piped in and said, “Let him handle it, M’am.” I looked at him questioningly. He said, “Let him handle it.” I got so infuriated I just put my merchandise down and walked off because I didn’t want to cause a scene by asking for what I wanted. NOTE TO HUSBANDS: When your wife walks off because she has been insulted, this is your cue to follow her. What did my husband do? Stay in there. Get railroaded and walked out with a $13.99 box of brand name junk. Didn’t even take the cue to follow the furious wife out of the store. There isn’t even medicine in medicine any more because of the meth heads in America and you may be saying, “Damn, it was only $9.00 difference. Why is she making such a big deal out of it?” The answer is because of the way I shop. I could turn $9.00 into 2 shopping bags full of groceries. I feed my family like royalty on a matter of a few bucks a day if not less because shopping is a skill. I went with a friend to the store and said, “What are you doing?” I saved her $75.00 just by showing her how to shop smart by comparison shopping and buying what was on sale. None of this gets my husband out of the doghouse with me by the way. I hate the idiotic waste of money. Everybody is now looking at how to save money and cut corners here and there when I have been doing it all my life. I wrote an excellent article on the psychology behind grocery shopping and how the stores are designed to get you to spend your money. You may not believe it but it is their job. Walgreens did it well tonight and for talking to me like the pharmacist did, I am not going back.